My Soapland journey began this year, on 23rd January 2014. Call time was 7.00am at ITV studios in Leeds. This whole concept was completely alien and new to me, so I had no idea what to expect. As I arrived and entered the studio my stomach was dancing and swirling with excitement. I signed in, joined the others, before boarding the coach as we were out on location at a shopping centre. I was a shop assistant. We pulled up at ‘base camp’ and it was still dark at that time of year. The camp was floodlit to reveal caravans and trailers, but what ‘really’ caught my eye [and other senses] was the catering van. She stood tall and grande with the most magnificent aroma… plus I was absolutely starving!! Full English Fry! I won’t even tell you what I had for dinner, OK I will but it was much later… lasagne, chips and salad. May I say it was divine! Back to breakfast, well I obviously indulged with all the trimmings plus more. So belly stuffed, hair done, make up done, then time for action. I watched live filming, saw cast members and gained so much insight and understanding as to what goes into a single scene, let alone an entire episode. I learnt that teamwork is paramount and this team worked like clockwork, so efficient and professional. 6 weeks later as I awaited the start of the episode I was going to be in, anxiously watching I spotted my hair for ½ a second. I was still happy with my debut TV shot. 6 weeks after that I was called in to film again as a fine diner on 3rd March 2014. On this occasion at the catering van I still had the full English but swapped the lasagne for salmon fillet with new potatoes and vegetables. Again out on location at an Italian restaurant with cast members Sammy Winward and Adam Thomas who play Katy & Adam in the show. I loved filming this scene, we sipped wine [grape juice], conversed and I had a great view of Adam [hehe]. 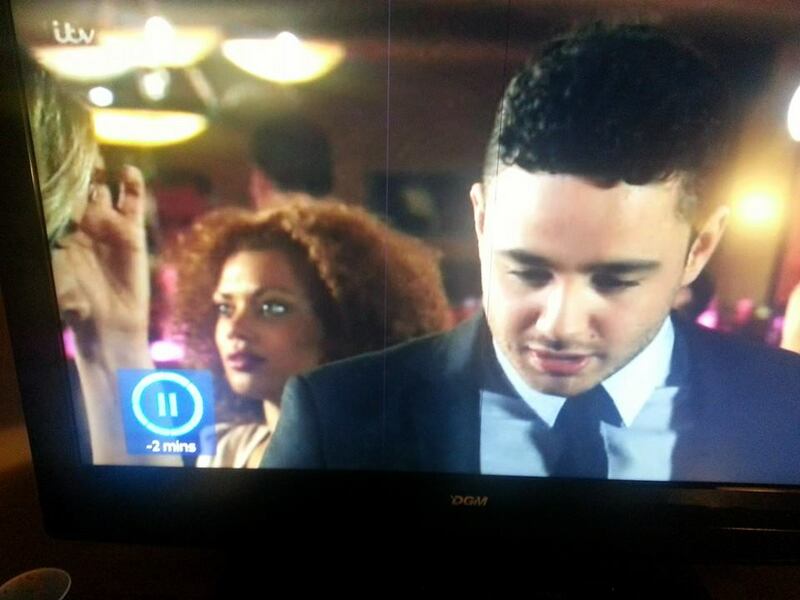 My latest soap adventure was in…Chester at Hollyoaks. Well it’s really filmed in Liverpool. So I was casually sat in ‘The Hutch’ the set was amazing and will now be able to visualise when watching. Seen loads of the cast Calvin’s brother, Caramel McQueen, Tony’s Mrs used to play Jackie Dixon in Brookside, Amy Darren’s ex who got sectioned off, Nancy oooo was great. Met some class peeps too on the day, was a great networking opportunity too.